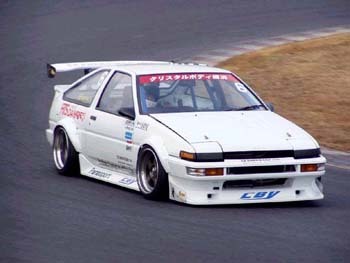 By far one of the most frequent areas of contention with ae86s is wheels. It’s ridiculous to the point of absurdity actually. 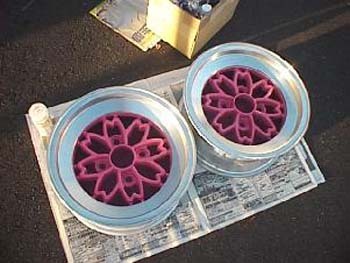 There is so much misinformation on the internet in terms of what will and will not work on an ae86 that most owners wind up running hideous wheels off a supra because they simply aren’t aware of alternatives. A lot of people online are driving this misinformation intentionally, pushing the myth that “offset is everything”. This is to try to make people feel that they’re nobody unless they own a wheel that’s wide to the point of being an oil drum with an offset so low it will smash the fenders off any car its fit to. It’s really a form of online “mine’s bigger than yours” designed to perpetuate the illusion that having bling makes you something, and it has nothing to do with how well a car performs. That having been said, there are several things that you need to ponder before you run out and shell for a set of rims for your baby. The first and most important thing is how the car looks with the wheels on it. This is obviously very cosmetic and shallow, but it is true that wheels first and foremost are the biggest change one can make to the look of a car. So far in fact, that they can literally make or break the look of a car. So, you’d better like they way they look on the car. Several computer programs exist to accomplish this task before you buy…but they really only exist for new wheels and new cars…and the ae86 doesn’t really fit with either of those. I would either advise hunting the internet to find an example of your car with the wheels you desire on it, or use photoshop to put those wheels onto a profile shot of your exact car. Keep in mind everything else you’re about to read before you buy because as always, it’s never that simple. The next most obvious thing that will govern what wheels you buy for your baby is simple: Cost. If you can’t afford it, you can’t buy it…and let’s face it, wheels tend to be expensive. 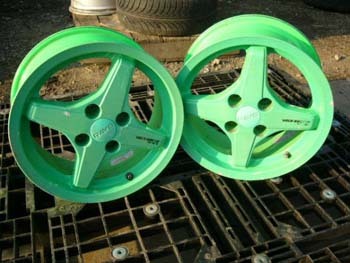 This can really limit your options when it comes to getting just the right rims for your ride. Most people really don’t understand how used wheel pricing works, so I’ll try to make it a little clearer for you. Think about buying diamonds. The biggest expense with diamonds is weight in carats. With wheels it’s the material they’re made out of, steel, aluminum, forged alloys, billet or even magnesium. The next most expensive part of buying diamonds is cut. With wheels it’s usually diameter in inches. Clarity for diamonds is equivalent to the width of wheels...color to offset…you get where this is going I hope. < It is said that with diamonds, every marginal increase in one of the four categories (cut, clarity, carat and color) increases the cost of the diamond ten percent. So, a diamond of X weight, cut, clarity and inclusion costs Y dollars…an identical diamond in everyway but with a step up in clarity would cost 1.10 x Y. The same thing is true for wheels. Big diameter, light weight, wide, low offset wheels are going to cost you…and every time you go more dramatic in one of those values, the price is going to go up and there’s nothing you can do. 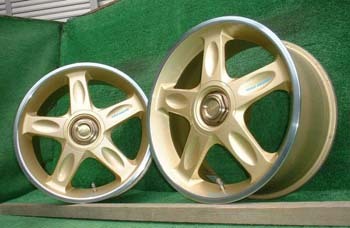 Here’s another example as to how this works: The Advan a3a wheel is quite common in Japan, selling in all kinds of sizes and offsets. The most common of these would probably be a 13” diameter with a 6” width in a +12mm offset. A complete set of four in good condition could run you anywhere from thirty to three hundred dollars…which isn’t a whole lot of money. Let’s say you wanted a set of 14” wheels instead of 13’s. The price just went up to four hundred dollars for the same width and offset in identical condition. Increase the width to 7” wide and we’re nearing six hundred for the set. Get it to 8” wide and we’re pushing a thousand dollars for a wheel that’s only 1” taller and 2” wider than the cheap set we started out with, and we didn’t even move the offset yet. If you were to factor in the randomness of rarity into the equation, it’s very easy to see why some old school wheels can reach into the thousands of dollars a corner. I would never pay that, but I just want you, the reader to understand. 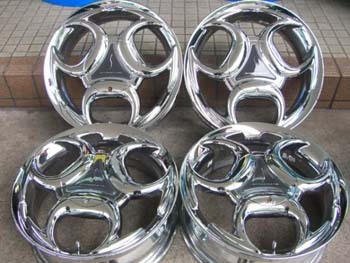 Furthermore, there are a lot of wheel sources out there. Understand that, unless you’re getting the parts through some friendly hookup somewhere, they’re going to be even more expensive because everyone’s making money. There are lots of people in the U.S. artificially inflating the price of wheels in North America because they know that you, the reader, don’t have another source to get the bits from…and they’ve convinced you that there is no other alternative than to pay them five hundred to a thousand dollars for a set of wheels they paid forty dollars for in Japan. Hell, I’ve imported wheels I bought for twenty eight dollars and sold them for over six hundred…take it from the horse’s mouth! So, now that we’ve talked about the qualitative, let’s delve into the quantitative. The diameter of a wheel is critical because it literally decides everything from here on in. It will decide your tire options, tire widths, grips, fitment etc, as well as affect your fuel economy, acceleration and unsprung weight. 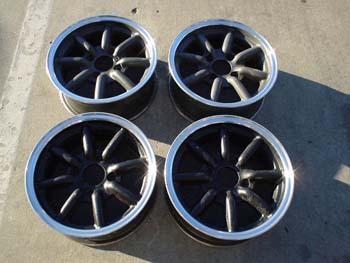 OEM fitment on the ae86 is usually a13” (sr5) or 14” (gts) wheel of 5.5” width with about a +27mm offset. A lot of people tend to run 13” wheels on ae86s because it creates a gearing advantage…it allows the car to accelerate faster than OEM because the wheels and tires are smaller than stock This also limits top speed and forces the car to turn higher rpm at speed X, generally causing it to burn more fuel. 13” tires are quite hard to come by, and when found in any kind of sensible sizing are either super-economy tires for Nissan Micra’s or full blown R compound racing tires that are unstreetable in any kind of weather. Either way, selection is only getting more limited, and I’d humbly suggest staying away from 13” wheels unless you need them for racing purposes or otherwise…it’s just not worth the problems with tire availability in the future. 14” wheels are much the same way, though there are currently more selections out there. Most are still economy car tires. 15” wheels used to be the most popular wheels on the face of the earth until the “plus sizing” fad swept the planet clean of small diameters in favor of progressively larger drug dealer wheels. There are still quite a few 15” performance tires out there including my beloved Bridgestone s03’s…but I should warn you the 15” tire is going the way of the dodo bird. I read in a newspaper recently that only seven percent of cars on the road are predicted to have 15” wheels by the year 2010. That’s not a lot of cars, which means not a lot of selection from tire manufacturers, racing or not…and this is only three years from now. So, buy 15’s with caution if you don’t already own a set. I’d just plain steer clear of 16’s for the same reason. When plus-sizing hit, the 16” wheel was the first plus-size to arrive, and the first to be left behind. < The 17” wheel was far more popular and has a bazillion more tires for selection than 16” tires. Even today 16’s are hard to find in a serious performance tire, and it won’t be long before they disappear all together. By the same token, 17” tires grow on trees, and certainly represent the latest and greatest tuning technologies for the ae86 in Japan where the N2 class has become dominated by 17” wheeled machines because of the gearing advantage the 17” tire sizes afford. Needless to say, I’ve had 13’s, 14’s and 15’s…and I’m making the move to 17’s while skipping 16’s all together. You should consider making the move too. 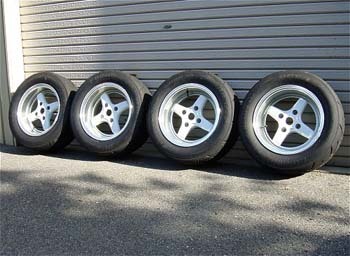 I’ve literally owned a hundred ae86 wheels (I’m not joking) in every size you can think of, and I still have a set of 14” revolvers and 15” superstars…but I have a set of 17” volks on the way because tires are just plain hard to find. I’m just preparing for the inevitable. Tires for my wheel collection will disappear from the marketplace in the next five years…make sure you don’t put yourself in a similar situation. Do your homework before you commit to a diameter. Here’s something more for you to think about: Assuming you keep the “rolling diameter” the same (the overall diameter of the wheel and tire combination), a larger wheel has several advantages. First and foremost, it has less sidewall on the tire. Lower sidewall “profile” tends to mean a stiffer tire (comparing the same model of tire in various sizes). This in turn means less breakaway warning, which can be a bad thing. However, it also gives you a more controllable, precision ride. There’s no slop to chew through. Because of the increase in wheel size, there’s more metal, which tends to mean more weight compared to small wheel/large tire combinations. v Small wheels tend to mean small weight…big wheels tend to mean big weight. Wheel weight is unsprung…it doesn’t ride on the suspension, but rather tries to drag the suspension around…and more weight means more drag. This means that the entire car has to work harder to do everything…and it’s not a good thing. Adding 45lbs per corner with some silly chrome plated 18x8” pimp wheels will make your car drive, accelerate, turn and stop like a garbage truck. 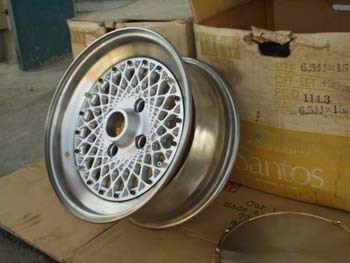 You can keep the weight down by buying quality wheels that have special fabrication techniques (semi-solid forging, hollow spokes or fancy alloys). In a sense, it’s all a trade off…and you have to decide how you want it. Width is a simpler issue. Wide wheels allow for wide tires. There’s only so much width you can stuff in a wheel well, and on an ae86 it’s about 8” (assuming proper offset) before you have to start flaring fenders and cutting out metal. Wide wheels are good because they allow the tire’s entire grippy surface (called a contact patch) to contact the road flatly. That is to say, some wheels are narrow enough that the tire will actually bow and not allow its surface to make full contact. You can go too wide, at which point the tire’s sidewalls will bend outward. This is a neat look that is popular in Japan, but it’s not really safe…it means you have to dramatically increase your tire pressure to keep it seated on the wheel which can also bow the tire as above…and a lot of tire shops aren’t going to install tires like that for you because it’s simply not safe. The wheel will actually stick out of the tire which makes it easier to damage as well. 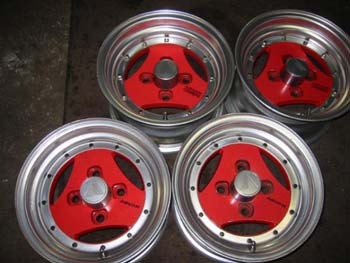 I’d look for between 7” and 8” of width for an ae86…but anything is better than the OEM 5.5”! Weight is where things start getting interesting and everything we’ve talked about comes into play. Ideally, you’re looking to buy the lightest set of wheels you can find. How light you ask? Well, believe it or not, there are 14”x7” wheels out there that run down into the 7lb range, per wheel. Even in 17” wheels, there are ones available as light as 12lbs! And no, it does not have to be a new wheel using fancy space age technology to be light…in fact some of the lightest wheels around are decades old. All I’m saying here is make sure you’re not attaching lead to your vehicle’s hubs. Shop around and make sure it at least weighs less than what you’re starting with. SSR Star Sharks (for example) in a 14” size will run under 10lbs depending on width…down into the single digits for 6” wide. 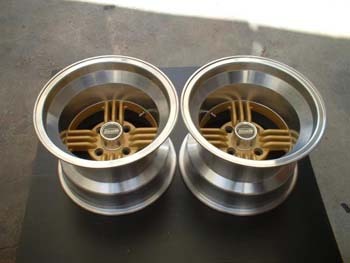 The same is true for the infamous Volk TE37, which will actually get down to 8.5lbs in a 15x8.5” wheel! Either way, don’t get something heavy if you can avoid it. I certainly have a heavier set of wheels than the ones I’m used to owning…but I wouldn’t trade them in because I like the way they look. I just make sure if I change them for better ones if I’m doing something competitive. We all drive on the street, so weight really only has so much effect that we can compromise…the key issue is that you should try to lower it as much as possible. 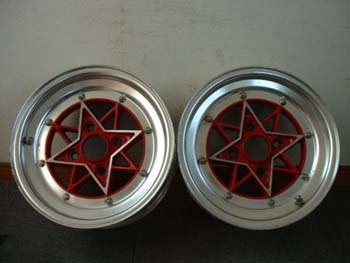 Offset is probably the most misunderstood wheel measurement going, especially with ae86 guys in general. It also has a huge impact on how a car drives, the price of wheels and fitment in general…and is of critical concern to you, the buyer. So, what is offset? Offset is simply the distance of the back of the wheel’s bolt face from the center of the wheel’s width, stated in a measurement usually expressed in millimeters. Backspacing, the redneck term for offset, is different in that it measures the distance of the back of the wheel’s bolt face from the edge of wheel’s rear lip…this measurement probably started because rednecks aren’t really good at math in the first place. Backspacing is a term you should instantly forget because nobody uses it but pickup truck drivers when they talk about their silly cast or heavy billet wheels. If offset makes sense to you, you can easily see that this basically positions the wheel horizontally on the car, in the plane of the suspension axes. Too low a numerical offset and the wheels will stick out too far. Too high a numerical offset and the wheels hit the inner suspension. Having said that, offset has some control over the track of the car, or how wide the car’s footprint is on the road. More is better, but there is a point where the car will fail because of the added leverage the wheel creates this way on the car’s suspension. You can always wind up with offsets so low that the fenders will get smashed off the car, or the tires will rub on the inner fenders under hard turning. I don’t recommend super-low offsets for that reason, in defiance of the “offset is everything” crowd. I’d stick between +10mm and 0mm if I could, in anything up to 8” wide. That should fit within the stock confines of the ae86’s wheel wells without rubbing, given a 195-50-15 tire. If you go to a 17”, you may have problems with this because the tires tend to start wider at about 205mm, which increases the width of everything by half a centimeter on each side. 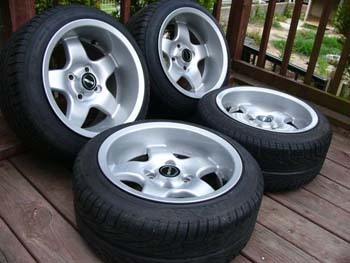 It doesn’t sound like much, but that’s enough to make or break some wheels I’ve owned in terms of fitment. I currently run a 15x8” +8mm wheel that I’ve had no trouble with on all four corners. Probably the most concealed factor of wheel buying is materials. You can’t see what the wheel is made out of when you’re buying it, and the average person probably wouldn’t know the difference even if they were told in the first place. 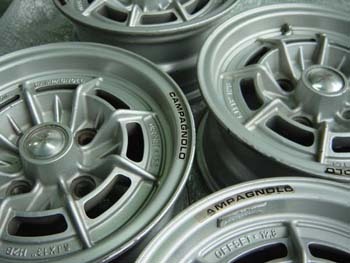 Most really old racing wheels are made out of magnesium…which is an extremely light, brittle metal. 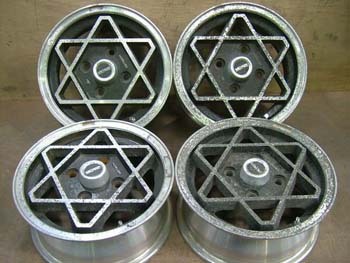 These wheels, while light, are prone to failure under load. They can actually shatter, believe it or not…and magnesium does not respond well to heat either. So, needless to say, making wheels out of magnesium is extremely tricky and expensive…and these wheels are not typically sold for street use. Magnesium is actually quite volatile in pure.state, and actually burns white hot when given an ignition source…and won’t go out until it has been consumed. Aluminum is still dramatically lighter than steel while having similar strength properties, which makes it a good thing to use when weight is a concern. Aluminum is more brittle than steel, but not as rare as magnesium or as dangerous. Given all of this, aluminum is the material of choice for a daily driven, useable wheel that will receive some abuse over time. I’d council staying away from steel. It’s cheap, and its heavy…and we don’t need either of those on a performance car. Now that we’re probably looking for an aluminum wheel, there are a few different types you should be aware of. First of all, there is the all-mighty billet wheel. This wheel is actually carved by a machine out of a solid piece of aluminum, which makes it extremely, extremely strong. Unless it’s done correctly, it can also make the wheel extremely heavy. 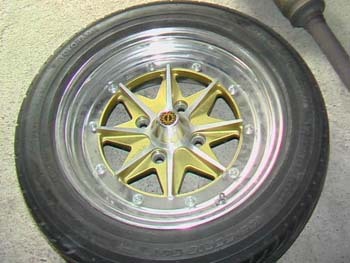 Wheels like this are very expensive and tend to be made by American manufacturers. The plus side is that they’re conventionally available new, and you can even have them made in your own unique design if you want! Weld is probably the premier billet manufacturer of wheels in the world, churning out high end wheels of uncompromising quality and craftsmanship while maintaining a useable weight. 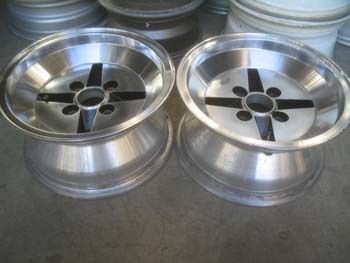 There’s a reason Weld wheels are standard issue on most Top Fuel and Funny cars. They make what is probably the lightest 17” wheel, 7.5” wide and weighing in at 11.75lbs, which is unheard of in a street car wheel. 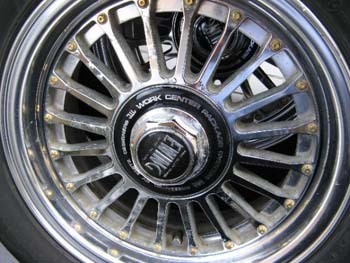 Most billet wheels, once damaged, are permanently ruined. The next type is a “one piece” design. This is basically a cast-poured wheel where molten alloy is poured into a mould that makes the wheel. They can also be forged…but either way, they’re made as one solid piece. These wheels can be light if made properly (forged, not cast) but tend to have issue with damage…i.e. if you damage them you typically have to replace them entirely. There aren’t a lot of wheels on the market that are a true one-piece design that I would advise buying except ones made by Rays and Volk. While Rays and Volk are essentially the same company, they tend to be marketed separately, which is why I name them both. Rays wheels created what they call a “semi-solid forging technology” in the late eighties that allows them to make one piece wheels with three-piece-wheel weights…which was unheard of back then and for the most part has not been truly duplicated today. It should be noted that Rays offers many other wheel lines, the rest of which are not performance oriented per say, so be careful when buying. Having said that, what is a multi piece wheel? You frequently here of two-piece and three piece wheels…but what does it all mean? 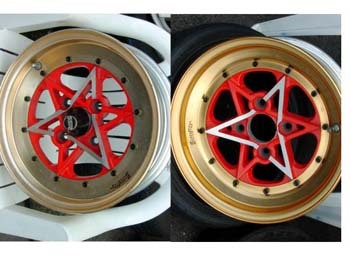 Back in the day, performance wheels used to be made out of multiple pieces. Typically there was the actual wheel (sometimes called a hoop or rim) that the tire seated on, and then there was either a wheel face that bolted into the hoop (two piece wheel) or an outer hoop, inner hoop and face (three piece wheel). These pieces were then bolted together to form a very light, durable wheel with none of the drawbacks of cast one piece designs except price. Because there are more pieces, there is more manufacturing and machining required, ergo more cost to the end user. 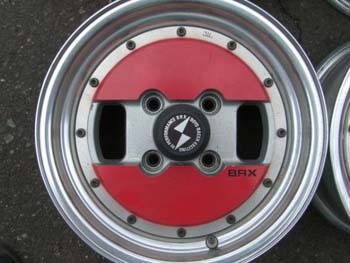 Companies like SSR, Work and BBS still make wheels like this, though there have been a few upgrades over the years. These manufacturers tend to weld their hoops together once fitment is final to add even more strength to the wheel with minimal added weight. This means the wheel bolted together as a three piece, but is now technically a one-piece wheel. These wheels are still expensive, but are probably the best compromise in terms of quality and user-friendliness going. My SSR Superstars are actually a four piece wheel where there is a face, inner hoop and two-piece outer hoop that all bolts together in one beautifully engineered masterpiece. The last and most important thing to understand about wheels is rarity. This is a tough concept for most people, but is really just supply and demand in action. Let’s face it, some wheels look better than others, and demand for appearance in something old or something made in small numbers but out of production can have a dramatic effect on the price of anything. Rarity really only applies to old school wheels. This term usually refers to wheels made by Japanese or Asian manufacturers (like SSR, Work, Advan, Dunlop, Yokohama, Goodyear, Bridgestone, Techno etc) many years ago. It also usually refers to out-of-production models, multi-piece designs and rare metal alloys. Basically, the wheel has to pre-date 1990 much the way an old-school car has to pre-date 1987. Also, a wheel can be old school but still be in production if it hasn’t changed. RS Watanabe’s are a good example of this. By comparison, Work Equip I’s have changed a lot since their inception, and don’t really qualify as an old school wheel, new in box. The other key thing to understand is, that while a wheel’s design may be common, its sizing may not be, which can make it rare. 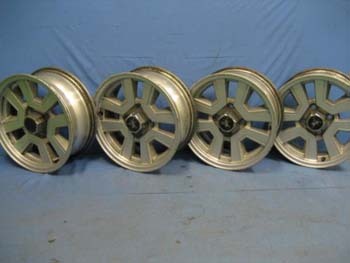 As you saw earlier, a 13x6+12 Advan a3a is common in Japan and priced accordingly…but a 14x8-10 is ultra rare and worth fifty times as much money to someone who knows this and appreciates it enough to want it for themselves. This is where the “offset is everything” crowd gains my ire. A lot of what these guys trumpet is really smoke generated by common wheels with offsets that are intended for race cars that don’t fit streetcars properly. Advan a3a’s are still Advan a3a’s…I don’t care how wide they are, or how much lip they have. My revolvers sport 4.5” of lip on a wheel that’s only 6.5” wide with an offset of +10…nothing special by any means. They still turn heads like naked Playmates on a street corner. My point here isn’t that I have a hate on…I love seeing crazy wide, low offset wheels on cars too. My point is that you, the reader, should not fall into the trap of thinking that this is how things are supposed to be and that you’re nobody without 14x9-20 Work Equip III’s. The car gods never intended a corolla to have wheels like that, they’re not practical, and you shouldn’t let your quest for good wheels get ruined by this. One of the biggest problems associated with wheels in general is recognizing them. As silly as it sounds, we all see wheels for sale on billions of different websites…but what are they? How do you, the reader, know what kind of wheel guy X has on his car? < This was something that always dogged me as many of my friends (at the time) had old wheels that were never sold in North America. Because of this, I set out to learn them all. Along the way, I started collecting pictures of them so that I could post them online for all to see in an attempt to catalogue the wheels of the world. Now, I’ve really only tried to cover Japanese market wheels because those are the ones that I had trouble with…and they were also the only ones that interested me. This is by no means a complete collection, it’s growing all the time. As it is, I still actively collect pictures of wheels in a never ending attempt to inform others as to what’s really out there in terms of style.